Learn to share these wonderful practices for physical health, balanced emotions and mental clarity. This training can be utilized as a career move, or ads value to your current profession or as a personal retreat to improve your health, vitality and well-being. You can choose which workshops or ongoing classes you would like to attend and in which time frame you would like to complete your training. You can begin your education any time. As a complete beginner we recommend to start with participating in a Tao Basic Seminar (Tao Qigong). Next events with Gabrielle: Ongoing classes in Christchurch and Oxford, Canterbury. Weekend workshops / retreats: Women's Qigong seminar 14 - 16 June 2019 in Wanaka. Or start with a Certified Universal Healing Tao Instructor in New Zealand or Australia in your area. These hours count towards the required Training hours. You can start in Auckland, Waiheke Island, Wanganui, Wellington, Nelson, Canterbury. In Australia you can start training in Sydney with Nathan Head, in Brisbane with Adam Gokmen or in Perth with Andrew Jan. Request contact details from your area. This Qigong teacher training is aimed to certify you in sharing the Basic Healing Tao techniques locally (where you live) to individuals on a one to one basis and to small groups. It also supports you in your personal development, growth and well-being. 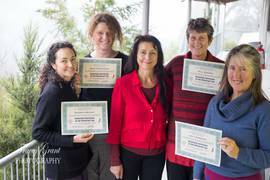 Many healers, psychologists and body-workers have integrated this training in their daily life and work. You can choose which workshops/retreats or ongoing classes you would like to attend and in which time frame you would like to complete your training. The training will be completed by attending a 6 days Teacher training retreat. The last training retreat was in Canterbury/ New Zealand in 2014. The next one will be in Spring 2020. During this retreat you will learn in detail how to teach the Tao Basic. To become an Associate Instructor can be a wonderful intermediate step to upgrade to a fully certified instructor. Twice a year a full Instructor Certification Training guided by Master Mantak Chia takes place in Thailand. The training retreat is 4 weeks. For certified Associate Instructors it is only 3 weeks.